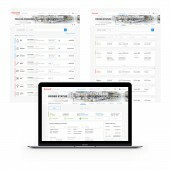 About Honeywell Aerospace : Honeywell Aerospace innovates and integrates thousands of products and services to deliver safe, efficient, productive and comfortable experiences around the world. Honeywell solutions are found on virtually every commercial, defense and space aircraft in service today. The Honeywell design teams develop solutions to these support products on the ground or in the air, from managing a fleet of aircraft to planning to providing in-flight high speed internet connectivity. Press Members: Request an exclusive interview with Honeywell Aerospace.